Program #CULT017. Recorded in New Delhi, India on May 30, 2010. Abhinandan in Hindi means congratulations. 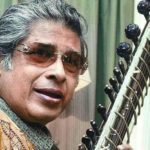 Sitar maestro Debu Chaudhuri, celebrating his 75th birthday at Kamani Hall in Delhi. Before a packed auditorium he performs ragas, Kalyani Bilawal, Yaman, Miyan ki Malhar and Bisweshwari. Debuji is a disciple of the legendary sitar maestro Mushtaq Ali Khan. He is accompanied on tabla by the virtuoso Sandeep Das, a disciple of the great Kishan Maharaj. On the tanpura are David Barsamian and Panchali Nandy. After the sitar recital we hear master vocalist Rashad Khan sing the popular evening raga Puriya Kalyan. Recipient of the Padma Bhushan award, he belongs to the musical lineage of Rampur-Sahaswan. He is accompanied by Shri Satyajit Talwalkar on tabla and Ustad Mehmood Dholpuri on harmonium.